Do not forget to read this page and remember its main aspects before going to play blackjack in a casino because here you will find everything a new comer should know about the game in order to play it confidently. Blackjack rules are not difficult of course but it does not mean they should not be known. Moreover, blackjack is the game of skills, not luck, so this knowledge will be not out of place to know. 1. Choose the right table. Pay attention to the minimum and maximum bets allowed at this table. Choose the table where blackjack is paid as 3:2 (not 6:5!!!) and cards are dealt faced up. 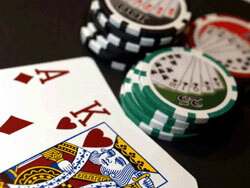 Usually, blackjack is played with 6 or 8 decks of cards but 6 are more profitable for a player of course. 2. Buy chips. You should make bets by special chips, and you can buy it from a dealer. Remember, that a dealer has no right to take money from your hands, so put them on the table. A dealer will give you chips. Note! Usually, change is not given back to you. Remember also that all chips are of different colors: white - $1, red - $5, green - $25, black - $100. 3. Make a bet. Bets are made before the cards are dealt. So, put your wager to the special place or box in front of you. When the cards are dealt you have no right to touch chips or change your bet anyhow. 4. Take 2 initial cards dealt faced up. (It is also possible to receive 2 initial cards faced down). A dealer gives 2 cards to a player and 2 cards to him/herself. Split - if you have 2 identical cards (two 8's or two 10's for example) you can split them and play with two hands now. But do not forget to make the equal bet on your second hand too. Surrender - if you think your cards are not good enough for winning you can surrender. In this case you'll have a half of your bet back. But remember that not all casinos allow this option! Double Down - this option supposes that you double your bet and gets one more card ONLY! Insurance - it is not very easy to use this option if you do not know card counting perfectly. If you see the first card of a dealer and this card is Ace you can make an attempt to minimize your loss (if you are sure that a dealer will have Blackjack!). In this case you are welcome to "insure" your bet by making a half of it more. If a dealer has blackjack s/he doubles your insurance and it happens to be that you lose only original bet. If a dealer does not have Blackjack you lose your insurance and continue playing with your original bet. All options described above are available for a dealer too. But the 2 specific options can be found which should be followed by a casino employee (a dealer) for sure. Stand on 17 - a dealer may HIT till the time he'll have 17 points or more. Hit on Soft 17 - some land and online casinos have this rule for a dealer: s/he will always HIT if his/her 17 are soft (Note! Soft hand is a hand which consists of an Ace and one more card and where this Ace can be counted as 11 without busting). Have you won anything? Great! The main thing is not to forget to receive the cash: take all your winning chips and exchange them to real money. To do it properly, you should know the information concerning blackjack payouts.